Today I have something special for you. Well, I guess it’s always special, right? But today is extra special. It’s not going to be just me on the show, I brought someone else on the show to talk about life-changing topics. 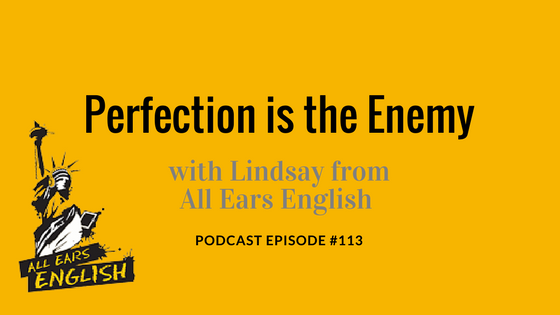 Lindsay McMahon from AllEarsEnglish will be on the show today, talking about the main premise behind her very popular show The AllEarsEnligsh podcast, the importance of connection, not perfection. More specifically, what gets in the way of connection when trying to communicate with others. Get in the way of means, by the way, to obstruct, become an obstacle, prevent from happening. So we’re going to talk about three things that prevent us from connecting with others when speaking English. And I’ll also be stopping the interview periodically to ask you some questions. I’m also going to stop the interview to go deeper into what was talked about, help you understand what we’re saying, and to slow it all a down a bit. I hope you enjoy it. But more than that, I hope today’s episode helps you focus on connection more than perfection, because perfection can be such a terrible enemy!